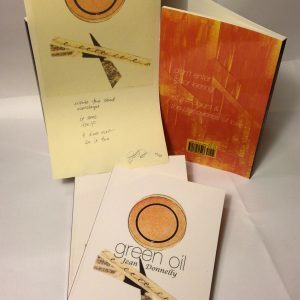 Further Other Book Works is thrilled to offer a suite of prints designed & letterpressed by poet josé felipe alvergue, in conjunction with our release of his second full length book, gist : rift : drift : bloom. Please view the presale brochure for more details and pictures. Price is for the full suite, which includes a copy of alvergue’s book, but the book and prints are also available individually on the shop page. 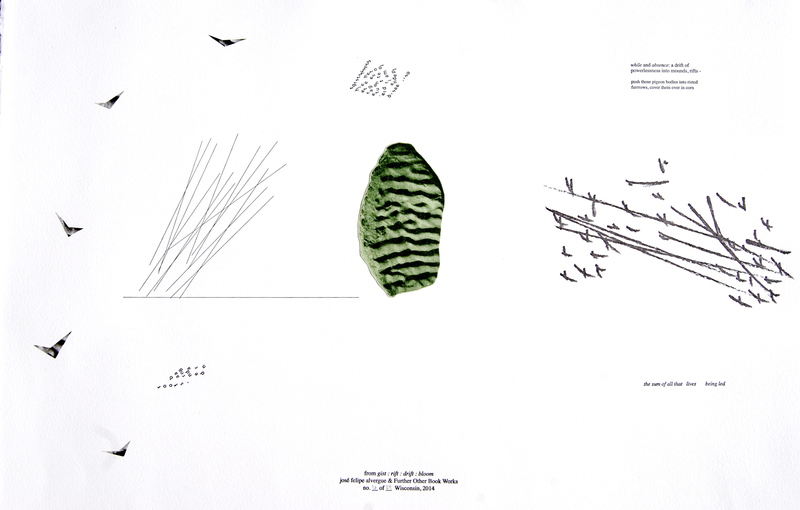 Print collage, variable edition of 24 signed and numbered copies, 15″x22 ½” on Rives BFK and Moenkopi Unryu. Single color letterpress + inkjet elements. 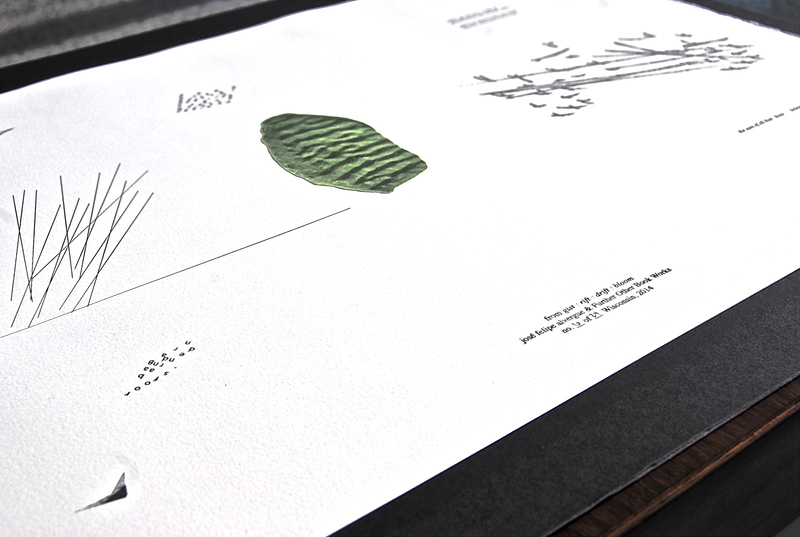 Further Other Book Works is thrilled to offer a suite of prints designed & letterpressed by poet josé felipe alvergue, in conjunction with our release of his second full length book, gist : rift : drift : bloom. 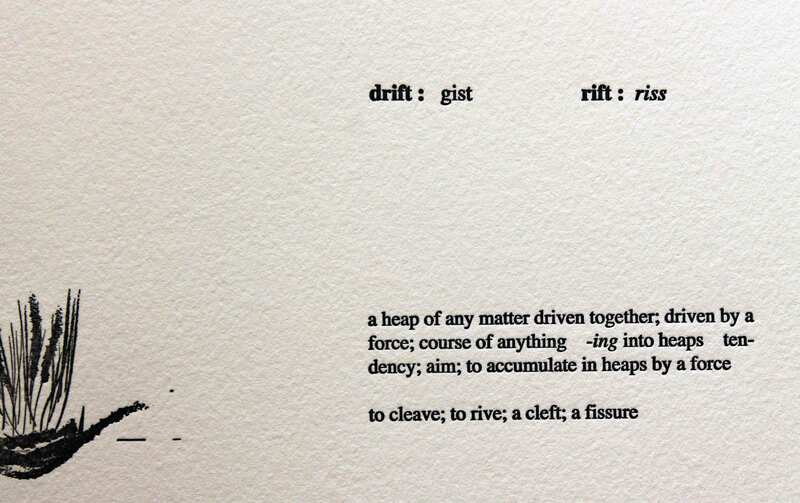 gist : rift : drift : bloom is an eco-historical meditation on the relationship between landscape and language. The book was composed between Buffalo, New York and Eau Claire, Wisconsin. 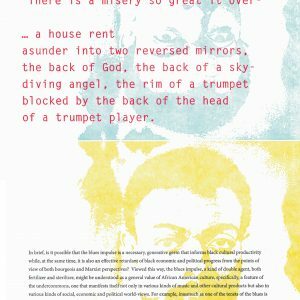 As a sort of interstice, definitions give pause to the continued evolution of language in the poetry, where a word is planted early. 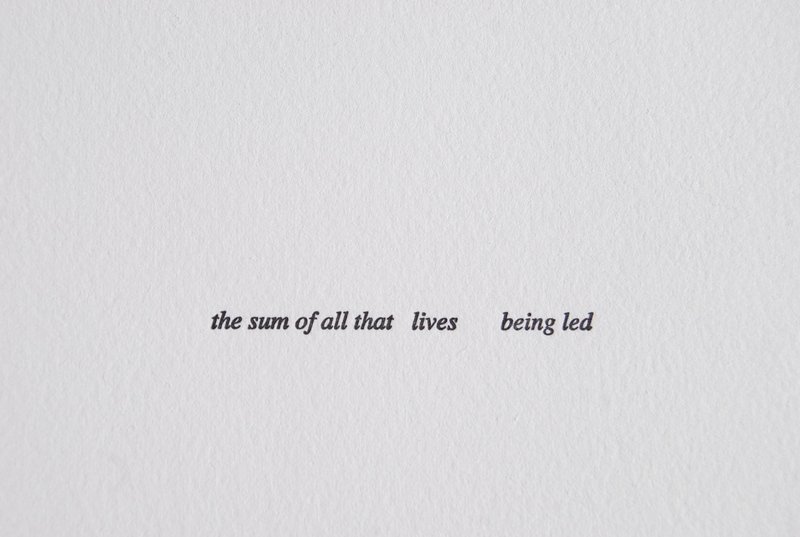 Compressed by language, or carried off by sketches and through space, these words bloom elsewhere. 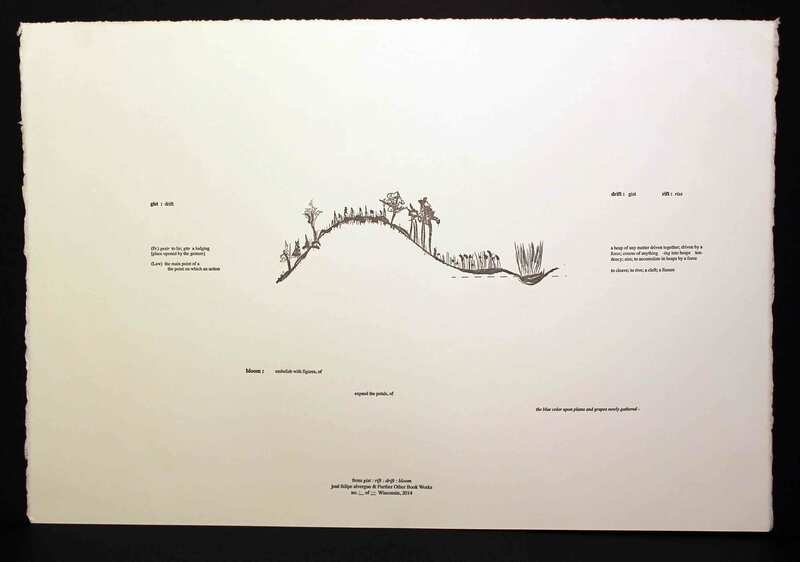 By turns poems, field guides, & pastoral sketches, alvergue’s prints are not as much broadsides from his book as they are expansions of its field. 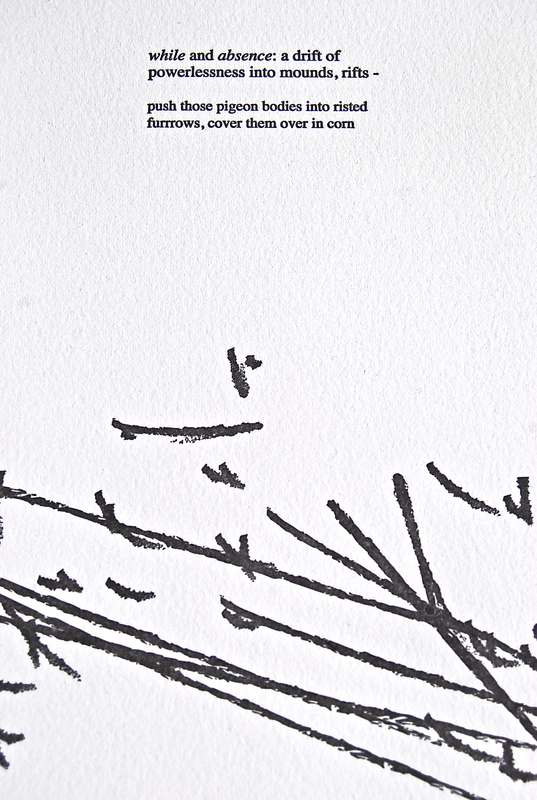 As ecologicical texture, these prints interact across motion and temporality— the motion of branches and stasis of trees, birds in flight and the traces of their eventual absence, the emergence of architectural sketches and grids blown across the Midwestern landscape. 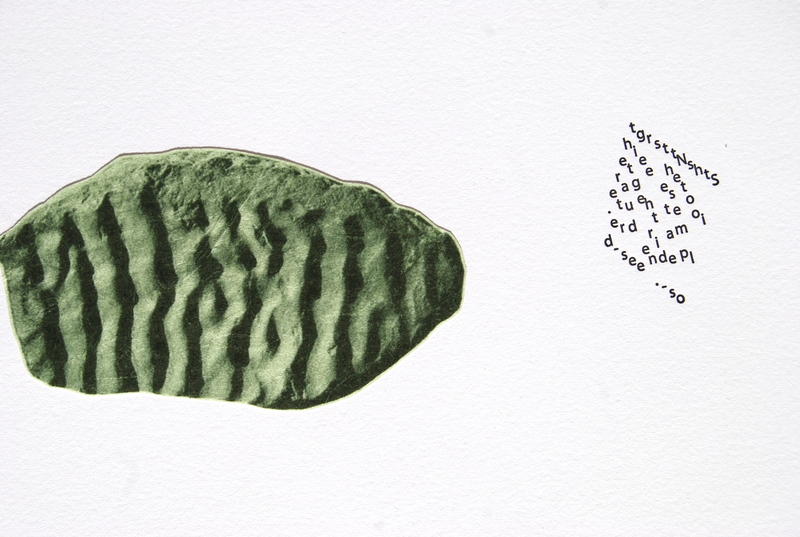 In an articulation of surface-distress, bold type and scratched type, bracketed language, and isolated utterances work closely in punctuated stanzas that have shifted across the paper. Drift and rift are here illustrated—the migration of samples in the many currents, the winds—and the surface-changes in time. 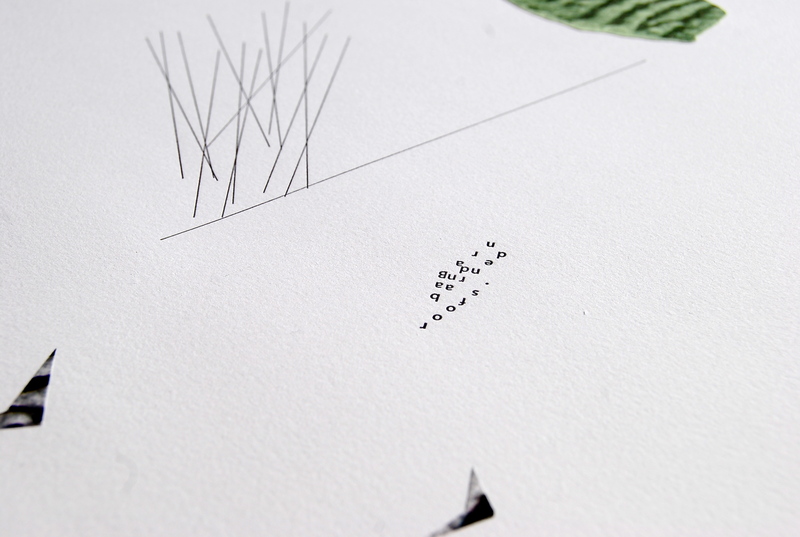 The process: These prints were letterpressed on a Vandercook #219, at the Minnesota Center for the Book Arts. 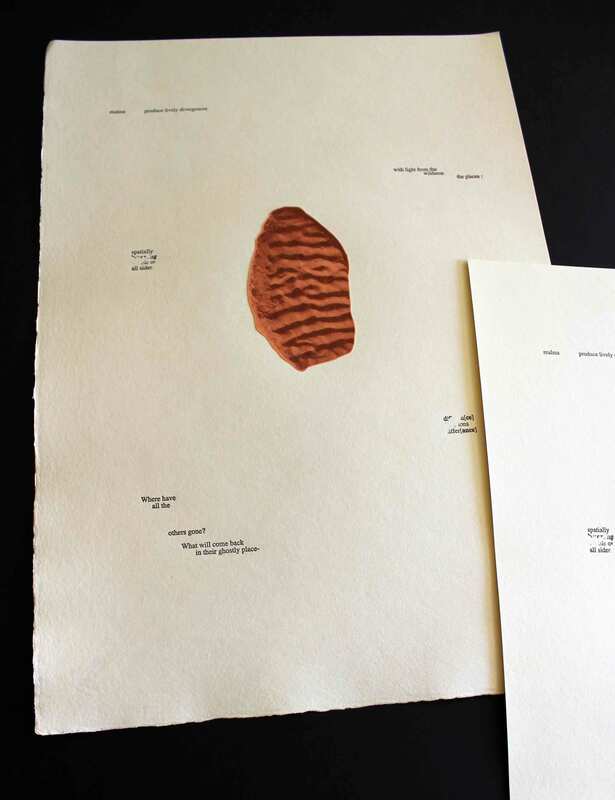 The print collages also incorporate color inkjet versions of the Potsdam stone sample collected near the Wisconsin Dells, ca. 1900. Please view the presale brochure for more details and pictures. 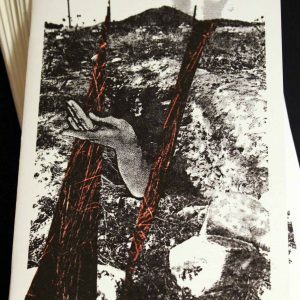 Price is for the full suite, which includes a copy of alvergue’s book, but the book and prints are also available individually on the shop page.